When is the chosen pincer here, White (in pro games) as often as not ignores it (see 3-4 point high approach three-space high pincer, tenuki). 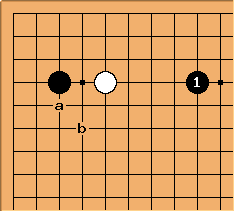 When White does reply here, White at a is most commonly played; after that, White at b. This normal variation of a 5-4 point joseki, played in the presence of , was adopted by some top players having White in this position. 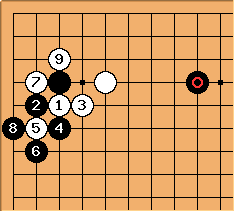 After Black has sente and is at a safe distance from White's strength. It is known for Black to play at to avoid this result.